Optional: toss with bacon bits, grilled chicken, prawns, or steak. 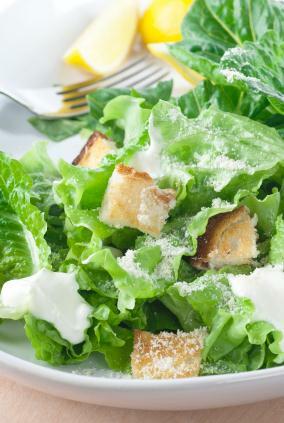 Wash and tear lettuce into a large bowl. Cube some bread and spray lightly with non-stick spray and microwave for 2 to 3 minutes until crisp. Puree all the remaining ingredients in a food processor or blender and toss salad. Sprinkle with parmesan cheese and croutons.